This is an excellent piece of testing to have in place on a continuous basis. Is it possible to build on this to also test the performance of Solr? Among other things, it would be interesting to see how much the overhead of running a http servlet affects this, and also it would provide a way to determine which solrconfig.xml settings will give optimum performance for different scenarios. It would be great to have similar tests for Solr so we could catch Solr-specific slowdowns. It's certainly doable (it's just software! ), but I don't think I'm going to have time near term to build this out. May I ask what is the hardware specification of your testing server? The server has 2 Xeon X5680s so a total of 24 cores (6 cores/cpu X 2 cpus X 2 for hyperthreading), overclocked to 4.0 Ghz. 12 GB of RAM. OS is Fedora 13. Index is written to a 240 GB OCZ Vertex 3, and content is read from a separate spinning-magnets hard drive. Reading documents from twitter they claim that fully loaded machine with 144M tweets cant handle 5000 RPS with latency 150ms. Looking at your benchmark test they do around 30. I am sure that i am missing something (like i am compering apple to oranges). So i will ask for some explanation please. I don't understand the numbers you're referring to; can you share the documents from twitter? Which benchmark of mine are you getting 30 ms latency from? And is 5000 RPS queries per second (search time) or tweets/second (indexing time)? Was referring to ruffly 30 QPS. I agree that their situation is to searching few things(tweet text, and usernames) but How they manage to get 5000QPS or i am wrong. OK I see, and thanks for sharing the link to the Earlybird paper. I'm not familiar with Earlbird's design, but scanning the paper it's clearly been heavily customized to match Twitter's specific needs (e.g. encoding a position in 8 bits since a tweet is at most 140 chars). It's also fully RAM resident, I think, and the search can terminate early since it's always sorted in reverse chronological order. Vs the 30 QPS number which is a general-case search on larger docs, using a single thread. Thanks for clearing that, what is common sweetspot for search threads if am using 10 threads(assuming i have tunned lucene right) can i expect 300 QPS. How many threads begin to affect performance or its app specific? oh.. and what it would be the relative performance serving from ram resident index. The speedup from multiple threads depends entirely on how concurrent your hardware is; I'd suggest at most 2*number-of-CPU-cores search threads. If your hardware has 10 fold concurrency (CPU and IO) then yes you should hit 300 QPS with 10 search threads. For RAM resident index, it's best to use MMapDirectory and let the OS manage the RAM; if there's is plenty of free RAM for it (ie, you keep your JVM heap sizes low) then it will hold the entire index (or at least the "hot" parts) in RAM. The speedup of a hot index over a cold index is enormous in many cases, because seeking is exceptionally costly for spinning-magnet disks and still costly even for SSDs. Yes i see. Thank you for understanding provided. Hi, maybe you can ask this on Lucene's dev list? 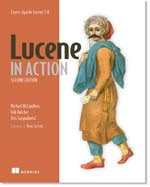 (dev@lucene.apache.org). replied name of thread is Posting list. We just have for every term a posting list where the term occurs. Correct address? Will try later... Thanks! That address is correct; try again later / from a different network? Yes, just open an IndexWriter on the index and add the new documents to it, delete old documents, etc. Hi Mike, I'm trying to read the benchmark as a way to learn the relative cost of different queries. Are the different query results comparable to each other? They seems a bit counter intuitive to me: Wildcard query (15 QPS) is just 2x slower than Term query (30 QPS). FuzzyQuery (edit distance 2) is faster than both (40 QPS). Primary key lookup is in another sphere altogether (800 KQPS). Perhaps QPS is very close, as I/O is a bottleneck, and in a memory resident index they would be very different? Do you have graphs of CPU utilization and disk IOPS during tests? Alas, no, not yet. Patches welcome! Python has the helpful psutil module that should make this straightforward.